Florida Governor Rick Scott thinks state workers are on drugs. So are poor people. Rick Scott issued an executive order requiring drug tests of state employees. Governor Scott made his announcement while praising the Florida Legislature for advancing a bill for mandatory drug-tests of all welfare applicants. In 60 days, current employees will be randomly drug tested 4 times a year. Beginning immediately, all new hires will be drug tested. Oddly enough, there are some who object to this kind of thing. Like the federal judge in Florida who declared this policy unconstitutional 7 years ago. U.S. District Judge Robert Hinkle found The Department of Juvenile Justice in violation of the Fourth Amendment when they ordered random drug testing. In a statement released by the ACLU of Florida, Executive Director Howard Simon remarked “I’m not sure why Gov. Scott does not know that the policy he recreated by executive order today has already been declared unconstitutional”. It seems Emperor Scott views the Constitution (state and federal) as a gray area. It turns out that one of Solantic’s more popular services is employer-related drug testing. Lucky for them, their founder, and major shareholder, is the Governor of Florida. This Whole “Teach Obama a Lesson” Thing is Working Perfectly, isn’t it? Epic rant to follow. This might leave a mark. In Wisconsin. In Ohio. In Michigan. In Florida. All across the country, the True Liberals’ efforts to teach Barack Obama a lesson are paying off in spades. Their plan could not have worked out more perfectly. After a year of shouting to the highest heavens about how much they were disappointed in President Obama and the Democrats, after a year promising to withhold their support during the 2010 Midterm campaign and, more importantly, at the ballot box, they got their wish: Democrats stayed home in droves. Huge numbers of Democrats across the country, many of whom had voted for the very first time in 2008, got up and went to the fridge instead of the polls that late Fall Tuesday. Yesterday, in Wisconsin, the tea party Governor and his cadre of Republican Senators figured out a way to bypass Senate Democrats’ exploitation of a loophole that allowed them to put the brakes on a GOP effort to drive a stake into the heart of unions in their state. Most collective bargaining rights for teachers and public employees are now gone as if they were trash taken to the curb. Sure, Scott Walker’s favorables took a beating there for awhile. If it weren’t for that pesky quorum loophole, this would have all been taken care of weeks ago and his numbers wouldn’t have tanked so far. But that’s water under the bridge and now they are back on track. The unions have been squashed like bugs and they can go back to laughing at the protesters as they are frisked and searched and scanned just to enter a public building. Since Rick Scott bought the Florida Governor’s office, one question has been plaguing me: what’s in it for him? A self-described business-man with no political experience drops over $70 million on his campaign. What’s the pay-off for his large investment? An answer is beginning to materialize, and it’s unsettling how not-surprising it is. Scott was forced out as head of the for-profit hospital chain Columbia/HCA as a result of federal investigation against the company (who later plead guilty to Medicare fraud and paid a record $1.7 billion in fines). It was revealed that the company had been ripping off Medicare while giving kickbacks to doctors who steered patients to their hospitals. 6 days before he announced his candidacy, Rick Scott was deposed for a federal investigation on fraudulent business practices at his company Solantic. As Governor, Voldemort transferred his Solantic ownership to his wife’s name. Solantic is regulated by the state, administers Medicaid, is licensed through the Agency for Health Care Administration, The Department of Health licenses its doctors, and both agencies’ secretaries are appointed by the Governor. Governor Voldemort is very open about his opposition to the Patients for Affordability Act (cleverly referred to as “ObamaCare”). Not only does he refuse to implement the law, he organized raised over $20 million to fight the reform in 2009. 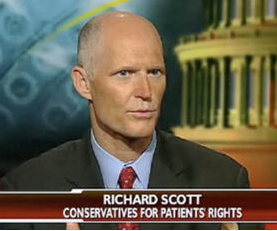 Rick Scott is the founder of Conservatives for Patients Rights (CPR), one of the front groups who coordinated with allied groups (including Koch owned “Americans for Prosperity”) protestors at town-hall meetings nationally. This flyer was one of many they sent with schedules of meetings. Scott has also recently taken action against pill-mill regulation. His controversial plans to kill the prescription drug database allowing law-enforcement to track patients that “doctor shop” to obtain prescriptions for pain-killers like oxycodone. Solantic currently sells on-site prescription medication, and recently announced news they’ll be selling them at a deep discount. So what do you think Rick Scott hopes to profit from his $70 billion investment? It’s a publicity stunt. That’s it. An article in the New York Times, April 9, 1944. 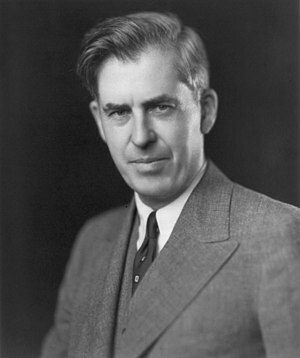 From Henry A. Wallace, Democracy Reborn (New York, 1944), edited by Russell Lord, p. 259. 1. What is a fascist? 2. How many fascists have we? 3. How dangerous are they? 2. A fascist is one whose lust for money or power is combined with such an intensity of intolerance toward those of other races, parties, classes, religions, cultures, regions or nations as to make him ruthless in his use of deceit or violence to attain his ends. While the government spending cuts proposed by House Republicans for this fiscal year mean only modest fiscal restraint, this restraint is meaningful. If fully adopted, the cuts would shave almost 0.5% from real GDP growth in 2011 and another 0.2% in 2012. There would be almost 400,000 fewer U.S. jobs by the end of 2011 than without the cuts and some 700,000 fewer jobs by the end of 2012. Rick Scott doesn’t seem to realize that he was elected Governor of Florida, not emperor. The Oath of Office for the Florida Governor begins with the pledge to uphold the Constitution of the United States and of Florida. Even though the Fair Districts Amendments received more votes than he, Scott canceled the DOJ approval (filed by the previous administration) and is in violation with the U.S. Voting Rights Act. Remember the “7-7-7 Plan” that promised “700,000 jobs in 7 years”? Since taking office in January, Scott has cut roughly 70,000 jobs, including the 30,000 jobs that would have come with high-speed rail plans. Remember the two official state planes that he sold? Senator J.D. Alexander not only questions the legality of those sales, but puts it in writing. According to Article VII, Section 1(c) of the Florida Constitution and Sections, the governor must receive approval from the legislature. In a letter, Alexander asked Scott what his legal authority was in making that transaction. He also asked about some of the $3.67 million that was kept from the state treasury. Democratic state Representative Rick Kriseman, of St-Petersburg, filed a proposed constitutional amendment that would allow Florida voters to recall state legislators, cabinet members, and the governor. To set up a recall vote, a petition would require 15% of the votes cast in the last election. Remember: Rick Scott won the election by only 50,000 votes.